I was born with a rare genetic condition called Oto-Palatal-Digital Syndrome; only I never knew there was a name for it until my daughter was born in 2006 and diagnosed by a genetics team. Two of my children have the same condition. When I was born in 1972, I had a cleft palate, a small mandible, and two fingers (the middle and ring) on each hand that were fused together. The doctor, who had never seen a case like this, told my mother I most likely wouldn’t live, and summoned the hospital priest, who baptized me when I was less than 24 hours old. After I baffled everyone by surviving, the same doctor gently suggested to my mother that there were options for children like me and that she should look into them, as raising a child with issues like mine would surely be a burden. My mother firmly told the doctor that she was taking her baby home. My mother was 41 years old when she gave birth to me, which back then was considered ancient to be having a baby. My issues were attributed to a myriad of things from “old egg syndrome” to the fact that she smoked, although to her credit I believe she quit while she was pregnant. I had a pretty normal childhood, although I was acutely aware from an early age that I was different from other children. I looked different, with my small jaw, and I had a pretty severe speech impediment that eventually improved with time and lots of speech therapy. As I grew older, I became more curious about my condition. I was told by my pediatrician that it was a syndrome of some sort, but because I had a mix of characteristics that were seen in a few other syndromes, it was hard to narrow it down. It could also be a fluke, I was told; a random mutation of a gene. For many people with genetic conditions such as Treacher-Collins and Down Syndrome, there is a good chance that they will meet someone with the same condition. I often wondered if I would get the same opportunity. When I met my husband and we decided to start a family, we went for a genetic counseling appointment in 2002. I had flashbacks to high school biology class as the geneticist made a Punnett Square, and both of our medical histories were documented at length. It was determined that, although there was no name for what I had, if I did indeed have kids, each child would have a 50/50 chance of inheriting my condition. In 2004 I gave birth to our first child, a healthy baby boy. Almost two years later, I was 20 weeks pregnant with our second child when I went in for my 20-week ultrasound. I found out that I was having a little girl, but the joy was dampened a little when the scan showed a small jaw, much like mine had been. She would have the same condition as I do. Although I had been mentally preparing for this, it still knocked me for a loop, and I had a good cry in the doctor’s office. As much as you are prepared, no one wants to hear that there is something wrong with your baby. She arrived a day past her due date and was whisked away to the NICU almost right after she was born, as her small jaw was compromising her airway. They were able to stabilize her long enough to carry her down the hall so we could see her and hold her before she was airlifted to a larger hospital two hours away from home. She had surgery on her jaw at five days old, and less than a week later I heard the words “Oto-Palatal-Digital Syndrome” or OPD for the first time. It was bittersweet, as no mother wants her child to have a genetic condition, but now I had something I could work with. A diagnosis — something I could type into Google and research the heck out of. Or so I thought. One of the first things I found out was that OPD is extremely rare. In 2006 there were less than 60,000 known cases worldwide. The numbers continue to grow, as more research is done, but I still have yet to meet anyone in person outside my family with OPD. I have found stories of individuals on the internet with it, but they are few and far between. Since my daughter was born, we have learned that OPD is a spectrum disorder. The three commonalities are a cleft palate, hearing loss, and webbing of the fingers and/or toes. Beyond that, an individual can have more severe craniofacial issues, intellectual disability, or heart problems; each case is unique. My daughter had multiple feeding issues and severe gastric reflux that resulted in a feeding tube placement. She was also diagnosed with intellectual disability, as well as autism, at the age of two and a half. 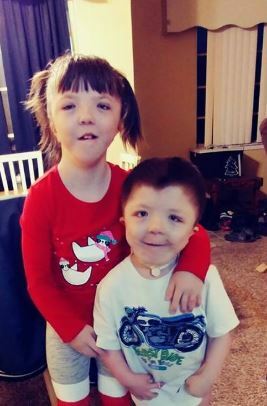 Our youngest son, who was born in 2011, also has OPD and does not have intellectual disabilities, but he had a tracheostomy tube placed at two days old because his jaw was extremely small, even smaller than mine or my daughter’s had been. His airway was compromised, and jaw surgery for him was not an option at the time. At four days old he went into acute respiratory failure. He was retaining carbon dioxide in his lungs and had to be placed on a heart/ lung bypass machine called ECMO. He was later diagnosed with chronic lung disease, which is unrelated to his OPD. My goal is to raise more awareness of this condition and hopefully reach someone with the same diagnosis who may be wondering, just as I used to, if there is anyone like them out there.